The Carthaginians were the greatest trading nation of the ancient Mediterranean world, at least until the Romans destroyed them. They explored the Western Mediterranean in a time when the Greeks and many others were experiencing a dark ages. Carthage based their power on the profits they made from trade and developed an empire that would in time be able to go toe-to-toe with the Roman military. These profits were made in several key areas, and the crafty Carthaginian traders fought many battles and wars to keep rivals out. Carthage traded in all the typical ancient goods from olive oil to fish paste. Perhaps the most important area of Carthaginian trade was the Iberian Peninsula; it was from here that they acquired vast supplies of silver and copper. They used this silver to trade with their mother city, Tyre, and other Phoenician cities for goods that they would then trade around the Mediterranean. Another important source of income for the Carthaginians was tin. Tin was used to make bronze, and you can bet that bronze was important to the Bronze Age, and Carthage held a monopoly on the tin trade. Acquisition of tin wasn’t an easy task though; their two sources were the Canary Islands and the British Isles. Both of these sources were far from Carthage, in the Atlantic Ocean and had never been explored. Obviously in order to pull this off they had to be first rate sailors. The Carthaginian explorers were nothing short of amazing, one of them Hano the Navigator, made it all the way down to the Ivory Coast or the Gold Coast in Africa. While another, Hamilco the Navigator sailed north along the Atlantic being the first of the Mediterranean peoples to explore that region. Amazingly he was able to sail all the way to England or at least Brittany in France. We have only the “official” reports of these voyages, since the shrewd traders didn’t want to give up any of their secrets. However, the Carthaginians couldn’t resist bragging a little for the sake of national pride. The traders of Carthage made sure to lace their stories about the Atlantic with a lot of sea monsters, killer sea weed and other hardships just to scare off any Greeks that might get some crazy idea about sailing into the Atlantic. Eventually the Greeks, Etruscans and finally the Romans started horning in on the Carthaginian monopoly leading to a lot of warfare. Eventually this spelt their doom, in epic fashion the Roman military took them down in three wars, finally whipping Carthage from the map. They took over their trade routes and proceeded to take over just about everything else. Carthage had a good run though, dominating Mediterranean trade from around the 8th century BC until they lost the second Punic War in 201 BC. 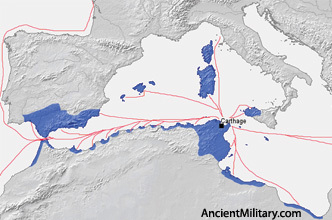 The Carthaginian navy was the nation's first line of defense. At its height Carthage had between 300-350 warships. These were mostly biremes and triremes, but included a few giant quadriremes and quinquiremes. 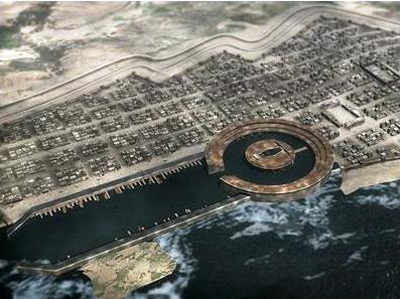 When at the home port of Carthage the warships would be docked at the amazing circular inner war harbor of Carthage. The island in the middle of it had a palace for the head of the Carthaginian navy. The outer harbor was a port for the huge fleet of merchant ships that dominated trade across the Mediterranean. Both harbors could be blocked off by chains to prevent enemy ships from entering. The remains of the great Carthaginian Harbors can still be seen today. Anceint Carthage, trade harbor and the inner military harbor.